Yes, it is possible to love your listing agent. Take a moment to discover why we do real estate so different! There is an expansive list of ways to find a new home if you're a buyer... but what if your a seller? The hundreds of sites can make it difficult for buyers to distinguish one listing from another. After a certain point, all homes can begin to look the same. My approach to selling your home is different than most. It is a combination of technology with all the complexity associated with life in the 21st century, but with a very simple foundation. I want you to love your home. Why? Because if you love your home there's a great chance that potential buyers will also fall in love with your home; much in the same way you did. Your home is unique. So I am going to present your home to buyers in a way that reflects that. Your home doesn't have a LR and a large m-bath! It has an "expansive, open living area perfect for socializing". It has "cozy areas for enjoying a peaceful moment by the fire". We want potential buyers to be able to literally imagine themselves relaxing at the end of the day in your homes, "master bath with luxurious whirlpool tub"! When potential buyers can hear your homes story and then place themselves in that story, they are more likely to fall in love with your home and ultimately buy it. That's why I spend so much time letting people know what makes your home special. A buyers first impression, like it or not, takes place on the internet. In order to gain the attention of buyers you need eye-catching photography. Photos that are dark, blurry or just plain bad reflect poorly on your homes value. Homes with professional photos will sell faster and for a higher price than those without. Let me show you the difference. This is a local home listed and marketed by another Realtor at one of the larger firms in Shreveport/ Bossier. Check out these photos. The left side photo is the other agents photo of the living room. This photo which appears to have been taken with a cellphone the living room looks small and uninviting. The right side photo on the other hand shows the fireplace, is taken in a landscape format and shows the room in a much more favorable light. The photo on the left is the homes kitchen as marketed by the former agent. Again the vertical orientation of the photo makes the room look cramped, dark and uninviting. Now look at the photo on the right... yes, it is the same kitchen! The photo taken in the proper orientation from the opposite angle makes the kitchen look so much more like a fabulous place to spend time with family and friends. I think you get the picture (pardon the pun) but lets do one more. How about this exterior. Maybe this agent is trying to appeal to those that love trailers and trash.... Showing the street and sky so prominently make this home appear small and insignificant. In our photo the home highlights the beautiful oak tree and the wonderful green lawn. It did take a few moments to move the trash cans and of course I did ask the seller to move the trailer... but I think you will agree that this photo puts this home in it's best light. That my friends is the reason that after 180 days on the market with the other agent... I was working an offer in 13 days! Buyers love looking at great photos of homes... and they want lot's of them! Every home that we sell receives professional photography; that's my standard and I will not compromise. We use these photos EVERYWHERE. Facebook is a great example. We have close working relationships with our areas top real estate photographers to make sure that our listings have every advantage. Our digital marketing is a huge difference maker that sets us apart from the average Realtor. Facebook is a marketing powerhouse. The average person spends over an hour on Facebook per day which is an incredible marketing opportunity. We'll create a custom Facebook marketing campaign for your property that reaches tens of thousands of potential buyers. Bottom line; we know how to turn "likes" into leads. Our digital marketing is a huge difference maker that sets us apart from the average Realtor. Eight in ten Americans have a Facebook profile. Those eight people spend on average of an hour per day on Facebook. This is an incredible marketing opportunity. 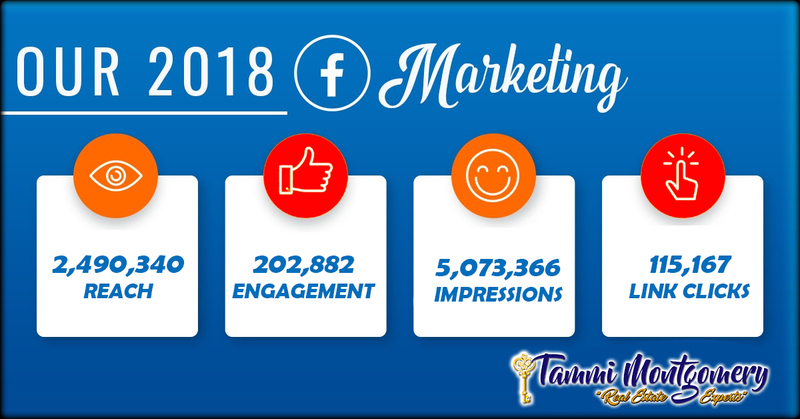 I have and in house marketing team will design a custom Facebook marketing campaign for your home that will reach tens of thousands of buyers. Don't take my word for it. Take a moment to listen to Chris Smith, a consultant who coaches thousands of Realtors around the country. Our marketing plan for selling homes is proactive, aggressive, and above all, results-driven. We don't just throw a sign in the yard, put your home on the MLS and hope for the best. We're here to make home buyers fall in love with your home and it all starts with that first impression. Our professional photographers and videographers are second to none and will use state-of-the-art camera equipment to take stunning HD photos, drone videos, and video tours of your home. Take a look at just one of our recent listing videos to see for yourself. 95% of home buyers start their search online, before ever speaking with a Realtor. We make sure that your listing not only looks great online with professional photos and video, but we also pay Zillow, the #1 home search site on the internet, thousands of dollars each MONTH to make sure your home gets exponentially more views than your competition. The biggest reason we're able to tell your Propertys Story is because we can control the presentation of it on our website. On calltammi.com the shackles have been released and we're free to show your home the way we envision it. Our website earns the attention of today's modern, mobile responsive buyers. It's a proven fact that consumers distrust ugly and boring websites. Your home deserves to be showcased in all its glory! Our website is user-friendly, mobile-friendly, beautiful, and captures thousands of leads every month. What makes a successful web site that has buyers coming back again and again? Zillow and Trulia have NO local content. They're MLS search sites. Buyers can search the MLS on our site too, but our site encourages buyers to engage with local content and this encourages repeat visits. Oh, and while they're visiting we'll promote your listing in a way that they can't miss! No one in Northwest Louisiana sells more residential resale homes than we do. With our volume we have access to so much information. Since we have sold so many homes in our area we have a truly intimate knowledge of not only how to market your home to sell it... but also information that is going to help you maximize the return on your home. Click on the graphic below. Since 2015 I have been the number one ranked agent in Northwest Louisiana. I'm the only agent in our areas history to be the top agent in the State at two different brokerages in consecutive years. My team and I sold over $70,000,000.00 in real estate in 2018. This year will be no different! Remember, "Don't call a friend; Hire an expert"! I sold 257 homes in 2018 and if you want to move... I want to be your Realtor!